A few weeks ago, I wrote about my frenzied frame of mind and my plan to calm the crazed brain: get up earlier than my kids. It’s been almost a month, so I think it’s time to let you know if my plan worked. I can honestly say, yes, it worked! Even though I only partially achieved my goals, the difference from getting up when my kids wake up and getting up and getting even one thing done before they get up has been tremendous. Please note: There have been some mornings when I let myself sleep because the nights with an infant can still be pretty tiring. I don’t beat myself up about those mornings as long as it’s not what I slip back into into doing every day. If you’re in a tiring season of life, give yourself some flexibility when you need more sleep! The truth is I have only gotten all three of those goals accomplished once or twice in the last month. We live in a pretty small house and all the bedrooms are clustered together, so in the early mornings I creep around trying to be as quiet as possible. I know where every squeak in the floor is and I tiptoe around them all. The problem with the goal of getting dressed is I can’t quietly open my antique dresser to get clothes out in the morning; if I don’t lay them out the night before, goal #1 doesn’t happen. 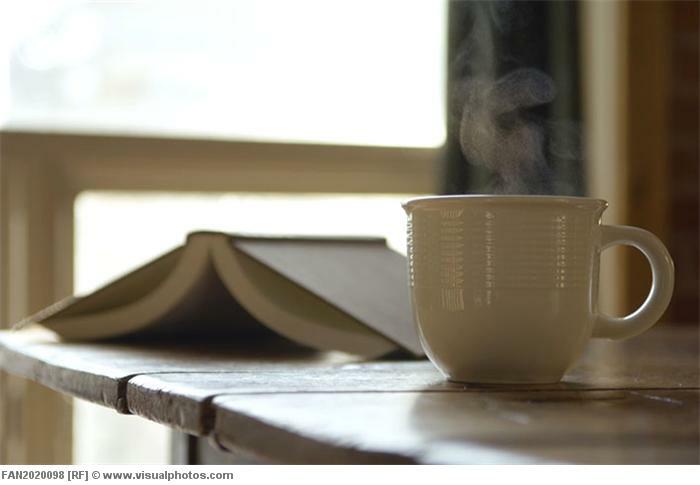 What does happen almost every morning is reading and praying. What a huge difference this time to focus on one thing at the beginning of my day has made in my mindset for the whole day! I’m not saying all my troubles are gone and I never lose it or react badly throughout the day. But I do have an underlying strength to draw from when the pressure cooker turns on. I get around to writing the short to-do list almost never. 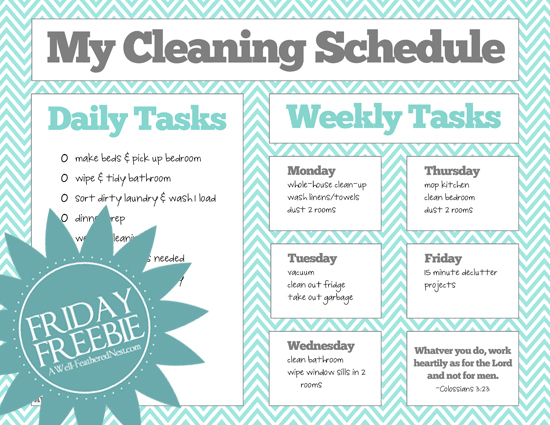 I am thankful that I’ve gotten into a better chore routine thanks to this Cleaning Chart from A Well Feathered Nest. I’ve tried a few different cleaning schedules, but this one fits the natural flow of tasks in our house best. There are still some specific tasks for each day that aren’t on this chart which I need to get better at writing down, but even if I don’t, I have some direction for the day thanks to this chart on my fridge. I’m hoping to get into a better habit of writing my to-do list the night before. Maybe this will calm my brain before bed instead of gearing it up for the next day? We will see. It seems like every time I talk to a fellow mom these days, whether a stay-at-home-mom, working mom, or a combination of the two, the conversation always turns to how to balance everything we need to accomplish to keep our home and family well cared for. The Twenty-Minute Morning experiment is working great for me right now, but I am far, FAR from being on top of everything in my household. It would be great if any of you readers could share any tips you’ve picked up along the way on what works best for your lives. Dads, too! We all have all kinds of hats we wear and try to balance. So glad for the update. Was intending to ask you for one when I responded to the blog about cooking. Your writing about Bread and Wine makes me seriously consider reading that book. Add another one to the growing stack!! I need a week free to just read. Maybe I will have that as something to aim for as the new year starts. Having undistracted time with the Lord is the way I am able to sense His presence more and have ears to hear what He may say to me through His Word. My prayers seem more focused and often Scripture based as opposed to random thoughts. As long as I approach this time as a relational time and not something to check off my do-to list/a comfortable ‘habit’, then I see spiritual growth and a deepening of my love relationship with the Lord. So, I am thrilled to hear of your progress thus far! Look forward to hearing if your interest in cooking grows next year! You just might develop a army of followers who need someone to show them the way! As far as balancing our busy lives, a schedule is what keeps me on target. Without a weekly and daily guide I can get easily distracted and waste time on things that could wait. But I hear that this doesn’t work for some people. I’ve tried it both ways and there is a world of difference. Being intentional in planning helps things get addressed and then completed. I have a book by Don Aslett called Done! How to Accomplish Twice as Much in Half the Time–at Home and at the Office. I picked up some good tips from him but I realize that approach doesn’t appeal to some temperaments. Some of us have to resist the need to obsess about things and that they must get done. For the rest of our lives on this earth I think women will wrestle with the Mary/Martha thing!